Let us introduce you to our first machete sheath made in America! We are expanding our extensive line of sheaths that are specifically made for us to ones that are being produced right here in the United States. Our goal is a Berry compliant machete sheath. 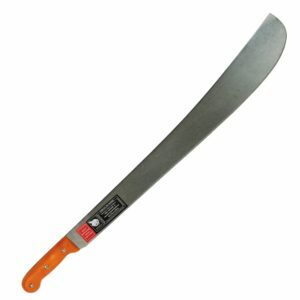 We started off with our most popular model, the 18″ bush machete sheath. We added an extra rivet near the tip for extra reinforcement and we have made the opening wider to 3 inches to accommodate the wider bush machetes that are out there. The black canvas material is 600 Denier Polyester Lamination. This heavy duty material is used for covering airplanes, boats, RV’s and other vehicles that need a durable, waterproof material with a soft inner face. A thick, yet pliable, artificial leather is used for the snapping grip wrap and for the belt loop attachment. The whole sheath is sewn together with high-strength Nylon threads and reinforced with steel rivets in critical areas. 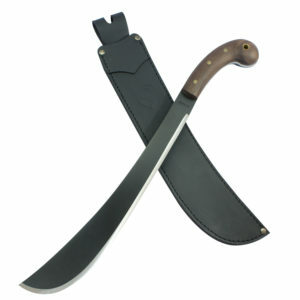 These machete sheaths are manufactured in the United States in Missouri and comply with the Berry Amendment (learn more) as it applies to canvas machete sheaths. Are you needing help finding a sheath to fit the blade you already own? Do you have questions about which sheath will fit the blade you are purchasing? The best way to contact us is by emailing us at [email protected]. If you are inquiring about a blade that you didn’t purchase from us, we will need to know the length of the blade, the style of blade, and the width at the widest point in order to help find a sheath that will fit. We are more than happy to assist you! 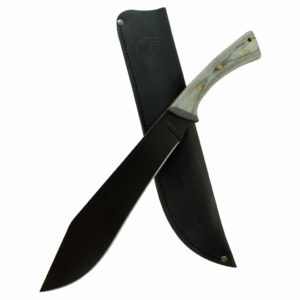 Black Nylon 22 Inch Bush Machete Sheath from Ontario Knife Co.